It was finally 3 p.m. on Friday and I could barely wait to take the elevator out of the building and jump in my car. I quickly checked the Seattle area traffic map on my Smartphone, yellow, red, and black, lots of red and black. Even up in Everett there was serious freeway congestion. 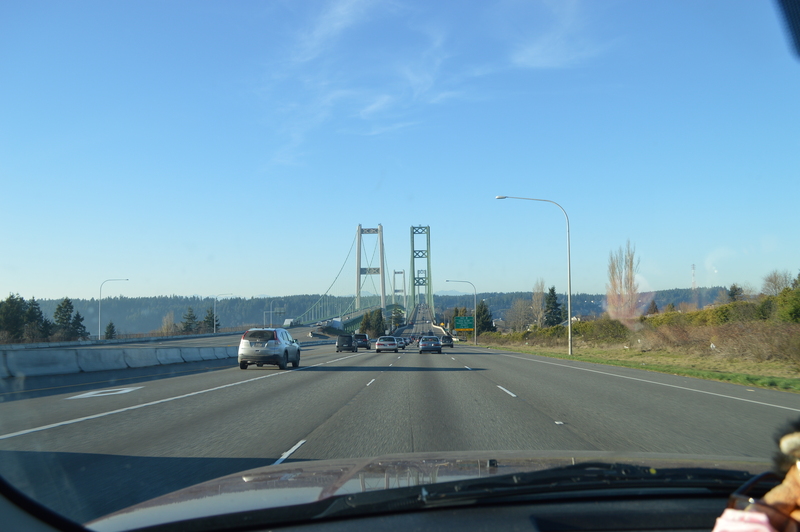 That was it; I headed across the Narrows Bridge. Judging from the travel times I jotted down from the satellite maps, I could easily reach Kingston, there were lots of sailings. But once in Edmonds, there was still serious traffic to Everett on I-5. I decided to check my timing and see if I could reach Port Townsend. The Coupeville run was at 5:15 p.m. There were only two sailings and only one would get me to Anacortes in time to catch the 7:50 p.m. ferry to Orcas Island. At the cutoff for Kingston I was 20 minutes ahead of schedule. I made the decision to go all the way north on the peninsula. At 6:45 I rolled into the ferry toll booth. “Do you have a reservation?” she said. I had no idea these ferry runs had reservations. Of course, it’s likely I haven’t been on this ferry since I was 6 years old. So I parked the car in lane 7, behind 5 others, shut off the engine and grabbed my camera to take some sunset photos of the Olympics from the dock. The sky was clear and the mountains were wider than the camera lens, clear and the sky was turning color. 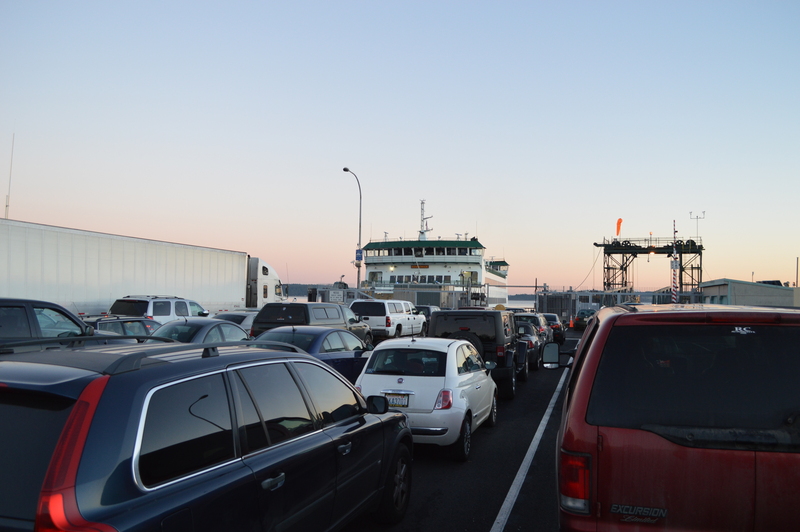 When the ferry Kennewick arrived, all the other lanes except 7 filed onto the boat. We sat and waited. Then, after what seemed like 5 minutes, a ferry worker pointed at our lane. The five cars ahead of me were directed onto the ferry. I was directed to stop in lane 5. In just a few seconds, he motioned with his index finger, one more. I pulled onto the boat, into a tiny spot just barely large enough for my cars. They had packed them together just enough to fit me in. I thanked them profusely. Last one on the boat. A vivid memory returned. On the last vacation I took alone to Victoria, Canada, I was going to walk on, but the attendant in the tool booth said there wasn’t enough time. I paid the full car fee, rolled onto the boat. They pulled the chain across behind me and shoved off instantly. This trip was my personal retreat. It was also a search to rediscover myself, who I am, what I love to do, and to plant both feet firmly on the ground in my new life, alone. It was also for a little overdue pampering. On this trip, there were hardly any schedules, except for ferries. There was no agenda, other than do what sounded great at the moment, take some magnificent photos of sunrises, sunsets, meet some interesting people and see curious things. 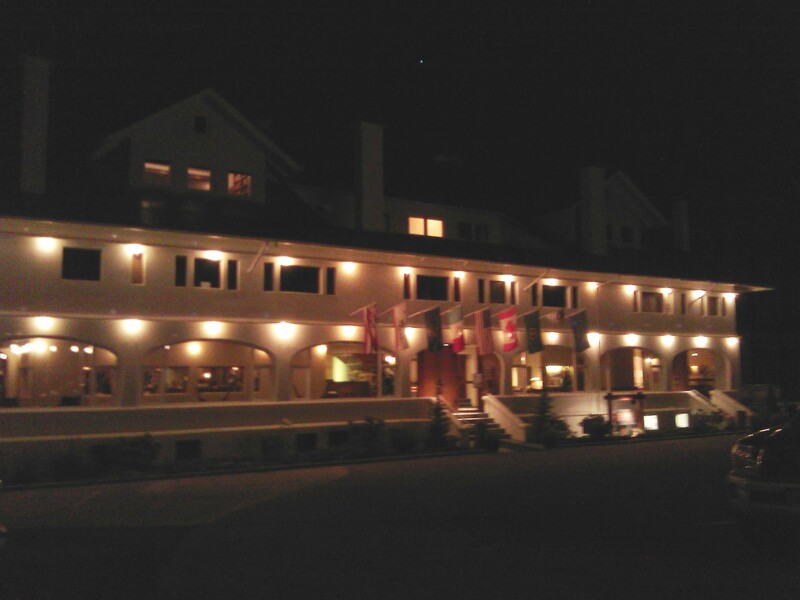 So I eagerly chose the Rosario Resort on Orcas Island. 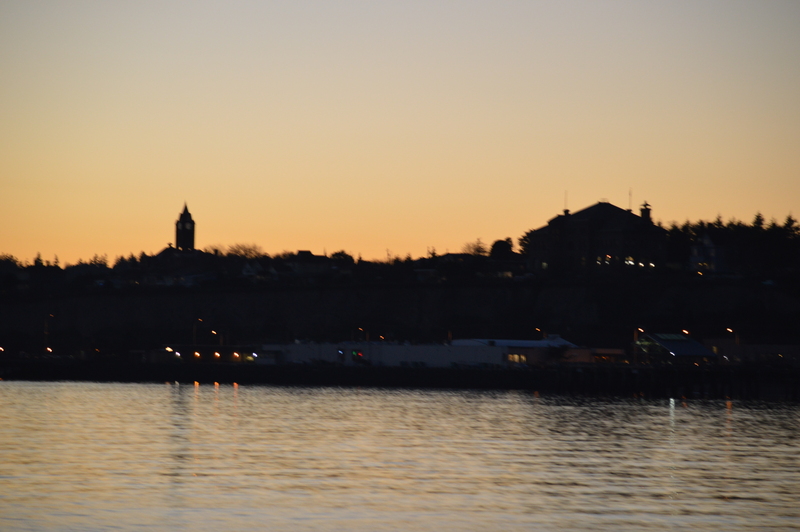 Once I boarded the Port Townsend ferry to Coupeville, Whidbey Island, the setting sun made a spectacular show in the clear night sky. The day began with some fog that cleared around noon and the January weather approached 50 degrees at its peak. There was some smog in the sky from the stagnant air, and it was magnificent for bending light at sundown. The dark blue water contrasted with a bright orange glow on the horizon that faded to gold then back to deep blue in the sky. I got out of my car and walked up to the main deck. 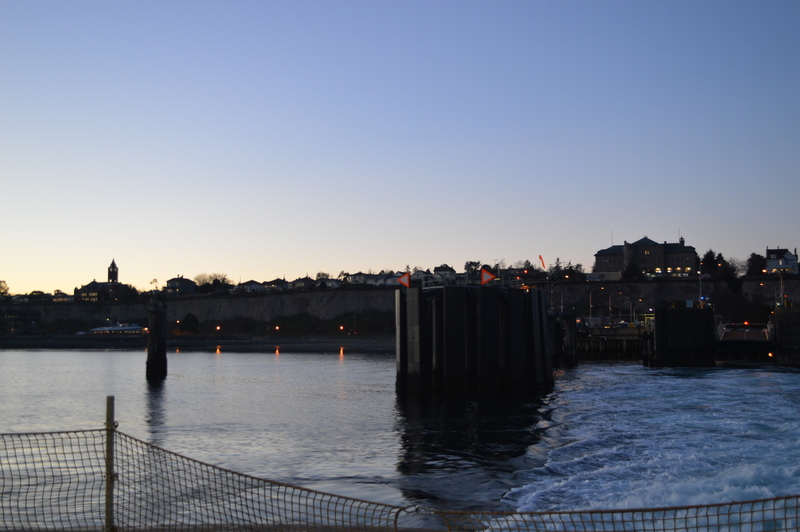 I took photos of the charming Victorian town of Port Townsend, then turned to look at the name of the ferry below the pilot house. 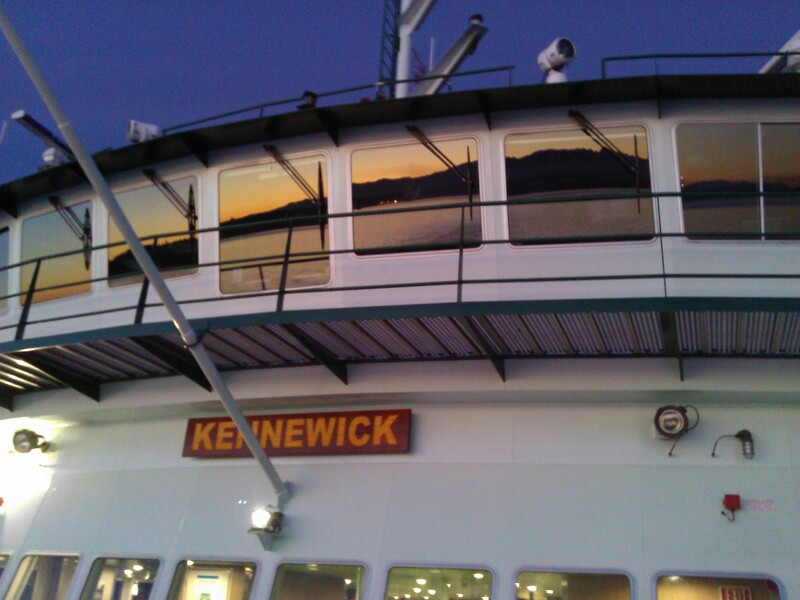 It was the Kennewick. 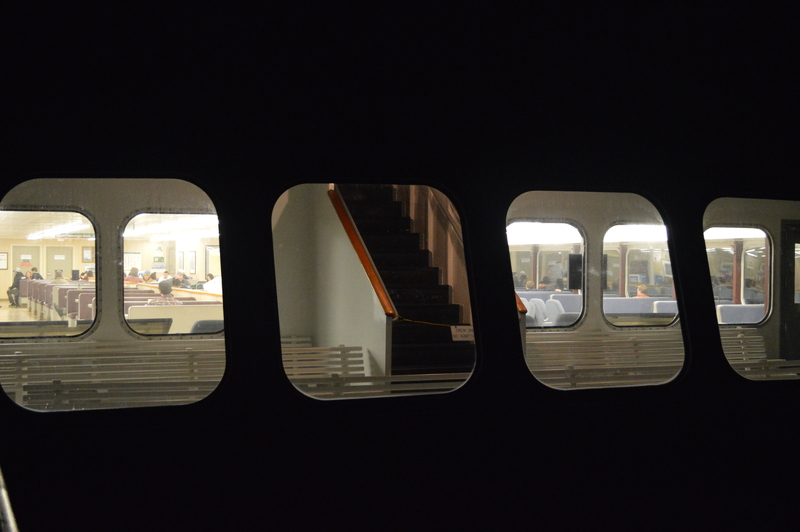 Then, wow, I noticed the sunset was reflecting across the windows of the ship’s control room. I snapped some photos and texted one to a friend. Once again, by taking the time to notice, some very lovely things were appearing before my eyes. The boat landed at Coupeville about 35 minutes later and the sky was already mostly dark, but still had a dark orange horizon. Cars quickly streamed out of the ferry and off to the city, a left turn at Coupeville onto highway 20 and off to Oak Harbor where I stopped to fill the tank with gas. Prices were reasonable on Whidbey Island, and there is a big selection of stations, including a Safeway if you have gas bonus points to use. Gas is about $0.65 cents more per gallon on the San Juan Islands. 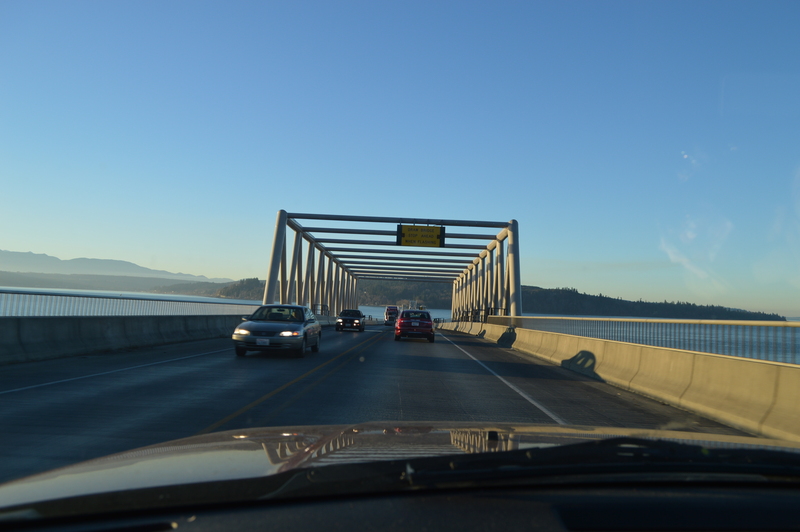 Deception Pass was in total darkness; there isn’t any lighting on the bridge. It is such an amazing scene in the daylight, it’s a wonder there are no lights to dramatize it at night. 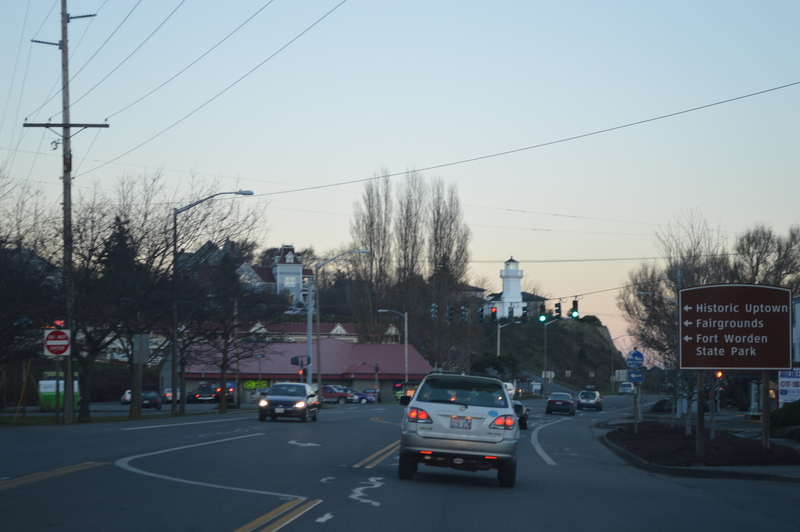 Passing through Anacortes, you have to watch the signs very carefully. There are big green signs saying where to turn for the ferries, but you have to watch where they are turning you several times. They conflict with all the businesses and advertising signs everywhere. 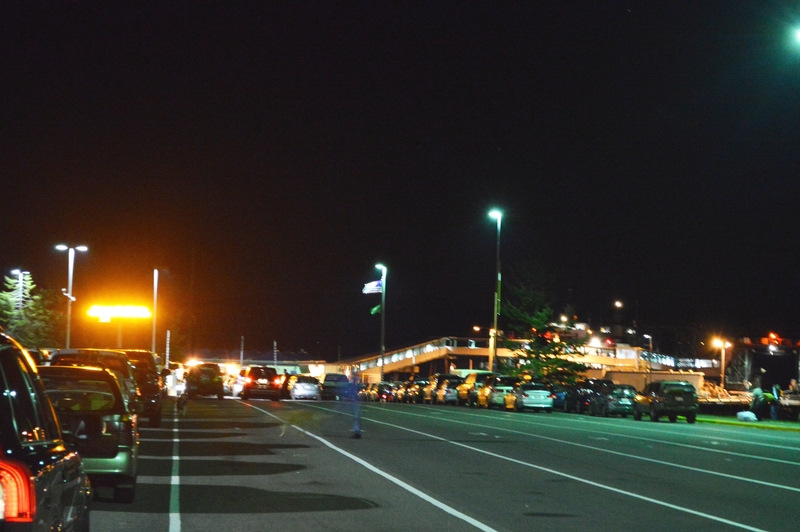 My arrival at the ferry terminal was at 6:45 p.m. The Yakima was scheduled to depart at 7:50 p.m. The Ferry Service recommends you arrive an hour early. I was on time and did not have to worry about reservations or lack of room on the boat. January isn’t the busy season. In the summer, there are reservations needed for the run to Sydney B.C. That reservation system helps the border patrols. Although it was 50 degrees out during this day, the temperature dropped significantly as it got dark. It was close to 40 degrees outside, so almost everyone stayed inside the boat lounge area. I bundled up in my gloves, hat and scarf, grabbed my camera and set out onto the outer deck in the bow. 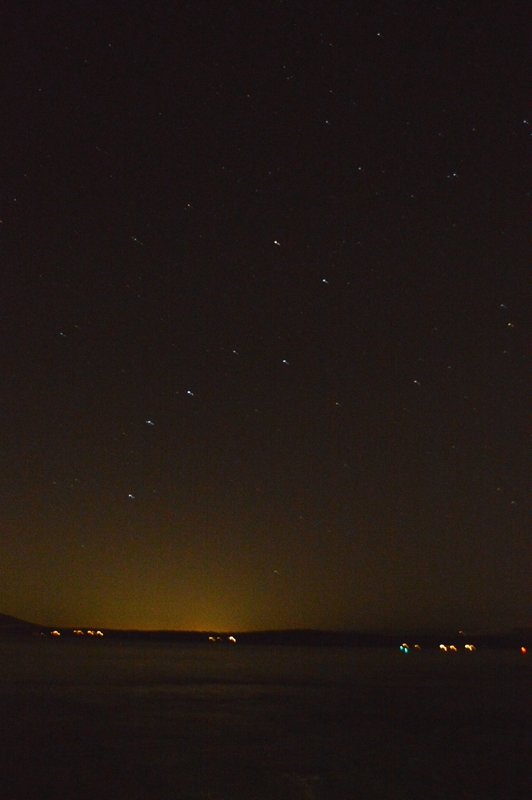 The big dipper was clear and bright in the sky, standing vertically on its handle directly in front of the boat. To the west, there was still a small patch, a faint glow of orange against the black sky where the sun had set. The islands were silhouettes in black, sitting in charcoal colored water. A sea of stars was splashed across the sky on this cold, clear night. The Milky Way shimmered with all of its pixels. Flickers of light pinpointed where houses dotted the islands. The water was still and glassy, broken only by the wake of the ferry as it slipped along almost silently in the night. It was lovely and I waxed romantic and poetic in a text to a friend. It was a moment to be shared. Inside the ferry, tables held couples and families, many working on jigsaw puzzles left by other travelers. Other read, snoozed or worked on their computers. 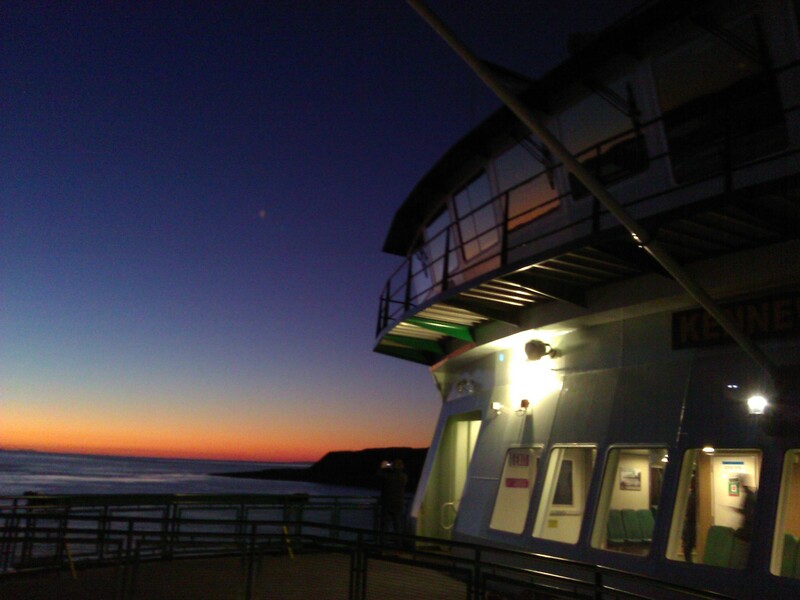 There was a brief stop at Lopez Island, then at 9:00 p.m. we reached Orcas; time to disembark. While waiting to de-board, I called the hotel to confirm my arrival. The lounge was open until 10 p.m. and I would be there in no more than 30 minutes. I was glad I had read a map before I left, however. The direction signs on the island are white lettering on brown wooden slats with tips that point the direction. If your night vision is weak or you don’t have your glasses on, you could miss a turn. Many of the island roads are only 25 m.p.h. because they wind in tight turns. You must drive carefully. The prolific deer darting out of the forests are a random danger as well. The darkness hid many of the islands beautiful features as I drove to winding road to the resort, so I had pleasant visual surprises in store the next day. Rosario is heavily lit with vintage street lights that are a huge part of its character. Once you turn the last corner, there is no doubt you have arrived. 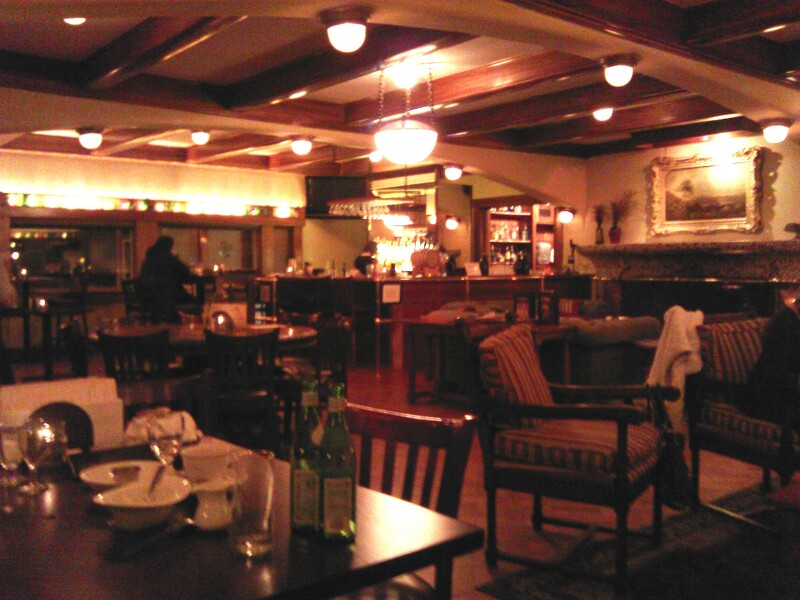 I checked in at the desk about 9:40 p.m., but decided to stop in the lounge before retreating to my room. Such beautiful scenery on my trip to the resort demanded celebration at arrival. It was a night for wine and chocolate; the lounge had a generous supply of both. I took a small table in the corner so I could observe the entire space. The warm wood beams, rustic tables, the soft couches near the fireplace with candles on the tables all around the room gave the room a comfy and warm appeal. 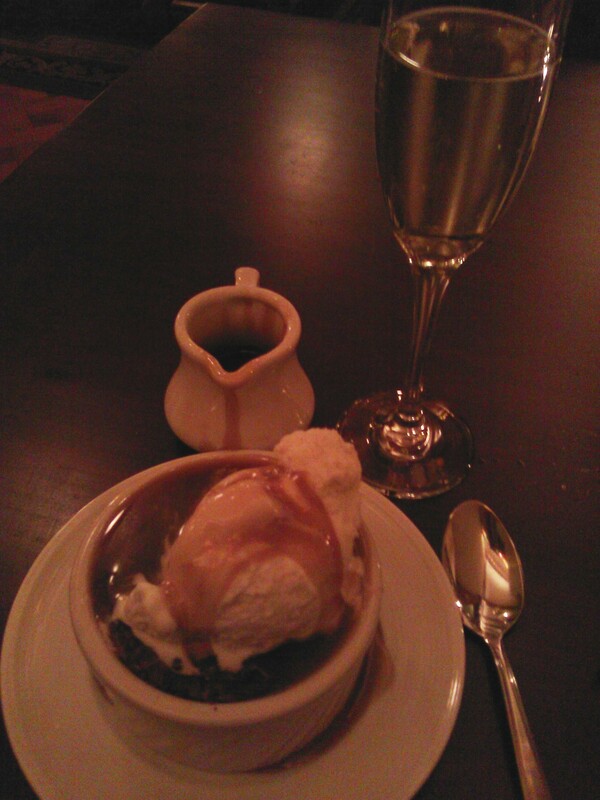 My choice of beverage was a Moscato d’Asti, a light sweet, bubbly white accompanied with a warm Ghirardelli chocolate soufflé mounded with vanilla ice cream and drizzled with a salted caramel sauce. These were incredibly delicious. I was thankful I skipped dinner as it was worth every spoonful of calories. I intentionally said grace before I stuck my spoon in the soufflé. It went something like, “Forgive me Father for I am about to sin.” This was not a weekend to count calories. The bar closed at 10 p.m. and I finished off my sinful dessert before they had finished shutting down, about 10:15 p.m. I set off to find my way in the dark to the building where my room was located. On the way there, a single doe crossed my path, I spotted a cluster of her friends waiting in the bushes nearby. 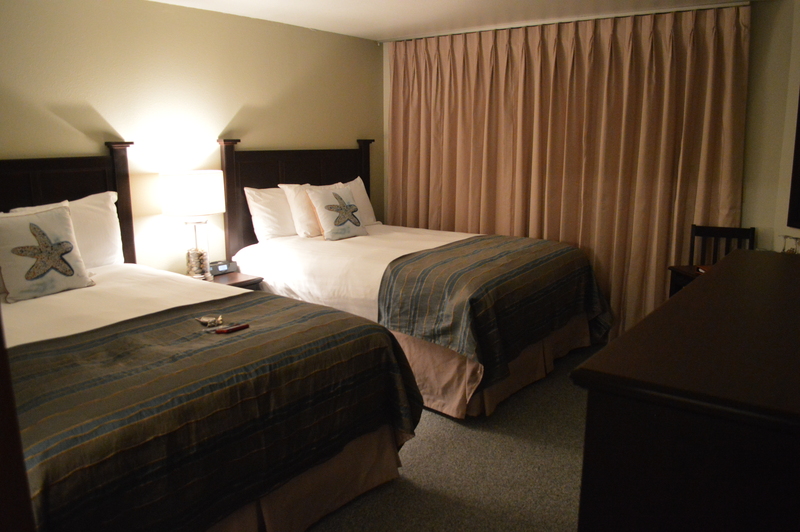 My room was cheerful, in white comforters and accent pillows with starfish. One end of the room was entirely windows with a sliding door to a large balcony. The harbor was clearly visible through tall fir trees. As I stepped out, I could hear rushing water, but could not spot the source. I set up my computer, downloaded the day’s photos, and posted a few on Facebook. It was about that time that I discovered there was hardly any cell phone signal at the resort, only 1 bar. I couldn’t send photos to my close friends that had request them. Ah, at least there was a great, open Wi-Fi signal for the Internet. So after an hour with Facebook and posting photos, I was ready to test the soft bed next to me. It was a queen, piled high with extra pillows. The room was a little chilly for me, so I raised the temp a little and snuggled down for a snooze until sunrise. The lake was so beautiful in the dark starlight. The lights glowed off the Moran Mansion in the distance over the water through the trees shaven of their lower branches. I left the drapery open all night to enjoy the scene.